When Microsoft CEO, Satya Nadella, strolled out onto the wicket at the Melbourne Cricket Ground before Christmas, admittedly, my attention immediately turned north. Over 1,500km north to be precise, to The Gabba. Why? Because as a cricket tragic, and a devoted England follower, November 2017 signals the start of The Ashes in Brisbane. And should Cricket Australia’s trial of intelligent Microsoft technologies go to plan this summer, machine learning could be the new kingmaker in the game’s most hotly contested series. Forget Shane Warne’s ‘Ball of the Century’, the bowling brutality of Dennis Lillee or the magic of Don Bradman, England will face a new foe in 2017. Bots. And lots of them. The game’s sporting body will use the latest in machine learning and predictive analytics to make sense of the mountains of player performance data available, allowing selectors to assess levels of preparedness ahead of crucial matches. For an Australian nation that has been plagued by injuries, this solves a key business - or in this case, sporting - outcome. Essentially, artificial intelligence - through Microsoft - is going into bat for Australia, highlighting how to create a competitive edge through utilising emerging technologies. But despite the buzz, England can take solace from the ongoing importance of the human element, forever a key part of the sporting equation. Would a robot have prevented Ian Botham’s outlandish match-saving performance at Headingley in 1981? Or neutralised Freddie Flintoff’s ferocious over at Edgbaston in 2005? Or even curtailed the last-wicket stance of Monty Panesar and Jimmy Anderson during the miracle of Cardiff in 2009? Almost certainly not, and this is a critical point to raise for the channel, as AI divides opinion across Australia. Naturally, ethical concerns remain regarding the true impact of automation on the future Australian workforce, with as many as five million roles - 40 per cent of the country’s jobs - potentially under threat. But with a changing of the channel guard already underway, perhaps it’s time for partners to think outside the crease. In this refreshed first issue of the year - which sees the inclusion of start-up, end-user and marketing insight - we will explore the pros and cons of chasing a market that is as threatening as it is thrilling. Somewhere in-between lies the answer, but the channel has to find it. Organisations recognise the disruptive power of artificial intelligence - James Henderson outlines how partners can profit from its potential. Admiring cognitive capabilities from afar is one thing, but building tangible business strategies to maximise an emerging market is another - Chris Player tests the theory. Cloud-based artificial intelligence and machine learning is on the cusp of providing Australian partners with new opportunities, but barriers remain - Leon Spencer talks to three local players about the state of the intelligent cloud. As organisations begin to experiment with intelligent apps, The Yield founder and CEO, Ros Harvey, explains to Holly Morgan how the Australian start-up is racing ahead in agriculture. 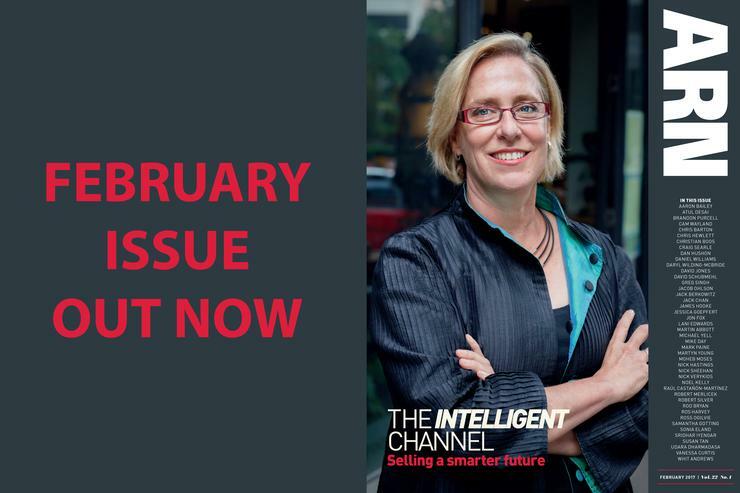 With the channel well-placed to capitalise on the growing promise of the internet of things, Hafizah Osman explains how Australian partners can progress further through intelligent things. One thing has become clear: smart machines are not future fantasy; they are commercially available. What are the tech jobs of the future? Increased technological innovation has created a need for new levels of expertise across Australia. Artificial Intelligence, machine learning and smart things promise a new future for the channel - Hafizah Osman explains how partners can capitalise. Bots are the new tech gold rush in 2017 - James Henderson examines 12 emerging start-ups innovating around the world. In this newly created column, James Henderson examines the future channel strategies of vendors across Australia, starting with HP country business manager – commercial channel, Chris Hewlett. Education is an important sector for the local channel. University of Sydney CIO, Mike Day, explains to Leon Spencer how partners can get ahead in the market. In reflection of the increased levels of innovation across the industry, this newly created column uncovers the emerging start-ups changing the face of the channel in Australia. The short-lived and fast-paced nature of the channel has rendered traditional sales techniques redundant - Holly Morgan explains how partners can maximise marketing in 2017. As digital transformation strategies dominate the Australian enterprise, CSC CTO, Dan Hushon, unveils the top ICT trends shaping business in 2017.